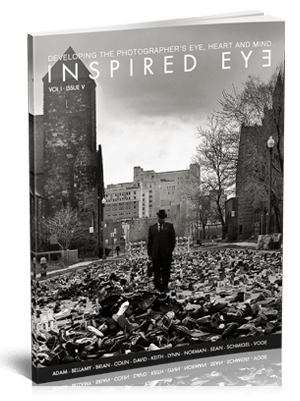 The issue V of Inspired Eye continues the Legacy of the magazine. It’s 293 pages in 147 spreads containing 6 interviews and 3 photo essays. The Photo essays take you into the world of the Sumos, make you travel back in time to Saigon of 1966 to end up in Sicily for Easter. As interviews, we have a diverse selection of photographers like Greg Allikas, the friendly Bellamy Hunt (the Japan Camera Hunter), Brian Day (cover shot) and Norman Shearer, Adam Marelli, David Voggenthaler and Sean O’ Brian. This issue also has reader favorites recurring columns like “The Inspired Frame” which touches upon Color Harmonies, In the Streets with Streetshooter, etc. This issue features cellographer Greg Schmigel who uses his iphone as his primary tool.